Viswanathan Anand won against Norway's Magnus Carlsen in Game 3 of the World Chess Championship in Sochi on Tuesday. Indian chess Grandmaster Viswanathan Anand on Tuesday defeated World Champion Magnus Carlsen in 34 moves in the third game of their world title match held in Russia, in the process breaking the "Carlsen Jinx" bugging him since losing the world title to Carlsen last year. At the end of the third game in the 12-game match, both the players have 1.5 points each. Grandmaster Nigel Short tweeted: "I said at the start of the game, 'contrary to popular belief, the match is not over'. However, for some Indian trolls, I am anti-Anand." In the Queen's Gambit Declined opening, playing white, Indian ace Anand started confidently and the moves progressed as per the book with the champion castling on the King side. While Anand was pushing out his pawns to pave the way for his pieces, Carlsen brought out his queen side knight. On move 7, Anand started pushing his c-pawn and his other pawns on the queen side and Carlsen similarly responded. A flurry of activity began on move 11 with Anand traded his white bishop for Carlsen's white bishop. Following that, Anand gave up his b-pawn in order to advance his c file pawn to the seventh rank. Anand's 17th move of putting his knight on the g5 square aiming for a play centered around his pawn on the seventh rank. This made Carlsen to go into deep thought for a whopping 32 minutes to make his move. This prompted world number 7 Grandmaster Anish Giri to tweet: "Interesting, the axiom that Magnus has an unearthly memory is being challenged right now." Speaking to IANS, world number 23 Grandmaster P.Harikrishna said: "It is unclear why Carlsen took so long. Seems he was figuring out the way to take Anand out of theory/home preparation." Indian Grandmaster Vidit Gujarathi tweeted that the board position was reached in Aronian-Adams but Harikrishna said the Aronian-Adams, though ended in a draw, was not an easy one. "The position is actually good for Anand as Carlsen's queen is not in active play and there is not much of an active coordination among his pieces," Harikrishna said. At this point Anand exchanged his knight on g5 for Carlsen's knight on e4 square. The champion captured the white piece with his knight on f6. Experts were of the view that the game was on razor edge and a mistake by any one of the player would be disastrous. Soon the other two knights got exchanged and Anand's queen got into active play, a luxury that was not available for Carlsen. In move 32, Carlsen gave up his rook for Anand's black bishop and facing further loss of a piece, resigned. Reacting to the game, Giri told IANS: "I don't think there was a change in strategy for Anand. The strategy has always been fine, just today it finally worked out well. Anand got very lucky that Carlsen was completely unaware of this relatively well known variation." "If Carlsen had been better prepared, the game should have been ended in a draw, but then again that's the weakness of Carlsen so there are no "ifs". I am very glad that Anand came back, now we will have a real fight!" he said. 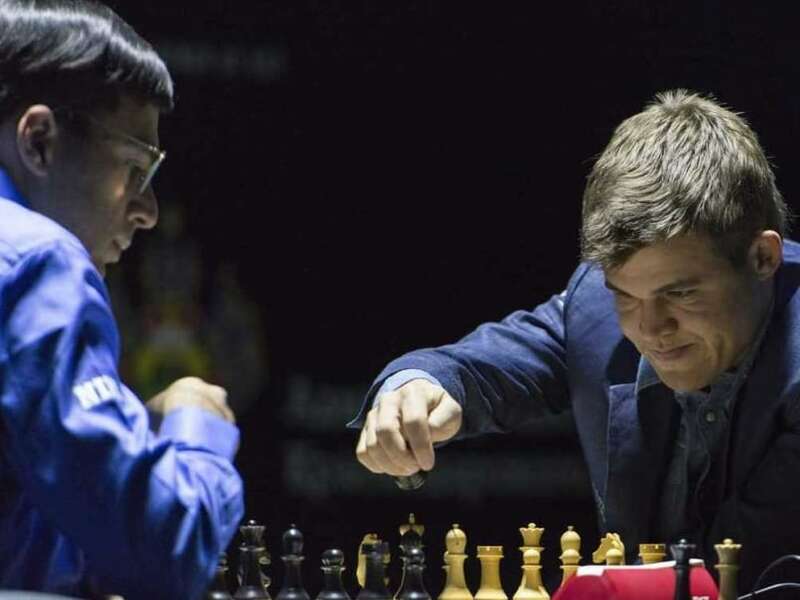 "The game once again proves that Anand plays well in complicated situation which is not Carlsen's forte," Harikrishna told IANS. He said Anand seemed to have prepared well whereas the opening seems to have surprised Carlsen. "It is difficult to play this position with black pieces," he added. He agreed that the win will bring a lot change for Anand and it is good to bounce back. On Wednesday Carlsen will play white.